Two recipes that are staples in our kitchen, especially at this time of year, are kombucha and elderberry syrup. Kombucha is a great source of beneficial bacteria, enzymes, and vitamins while elderberry is a traditional remedy to ward off illness. 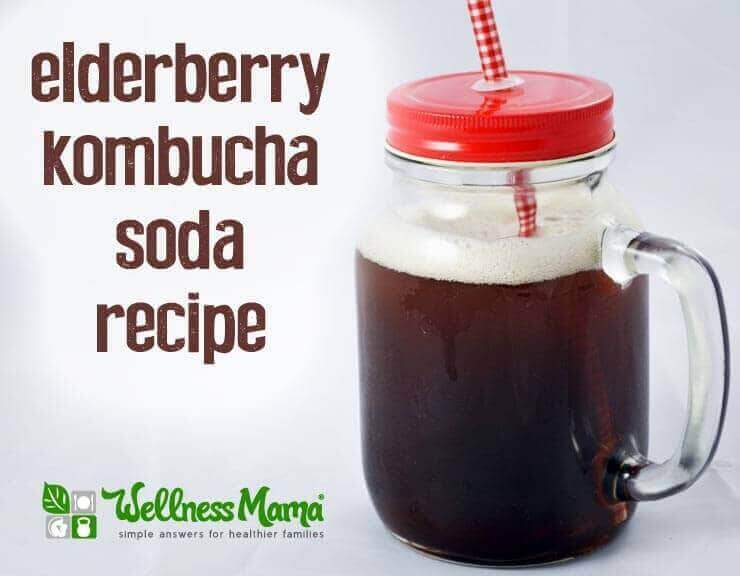 Combine the two and you get a delicious, fizzy, and immune-boosting “soda” that is delicious and easy to make. If you’ve never made it or tried it before, kombucha is a traditional fermented tea that contains enzymes, probiotics, and vitamins. Though it is brewed with a sweetened tea, the sugar ferments out in the process of making enzymes and probiotics, leaving a finished product with minimal sugar. 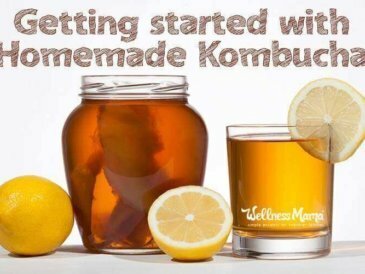 Here is a tutorial on getting started with making kombucha and I ordered all of my supplies from Kombucha Kamp. If you aren’t a fan of the DIY version, pre-made kombucha is now available in most grocery stores and even some big box and discount stores. 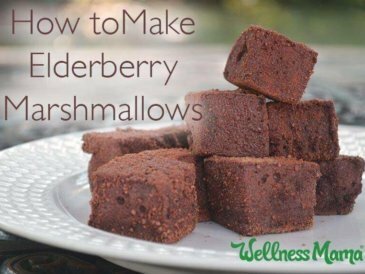 Elderberries are a traditional remedy for colds and flu. Elderberry syrups, tinctures, and capsules are popping up even in regular grocery stores. I prefer to make my own elderberry syrup with dried elderberries so I can make sure I use quality ingredients. Here is my original elderberry syrup recipe. Simple Version: Use pre-made elderberry syrup and homemade kombucha. The elderberry syrup serves as the sugar source for a second ferment which creates carbonation (see this recipe for instructions on why and how to do a secondary ferment) and all you have to do is pour the elderberry syrup into the kombucha. 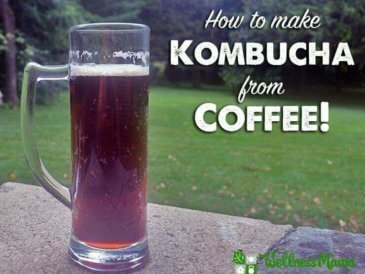 You can also just add 1 teaspoon of elderberry syrup to a glass of pre-carbonated homemade or pre-made kombucha and drink immediately. 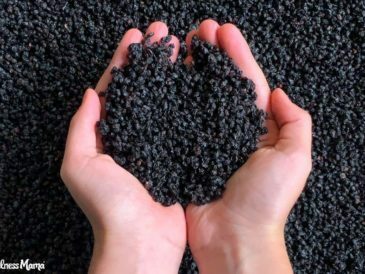 Basic Version: If you don’t already have elderberry syrup on hand, a simpler secondary ferment could be made by simply adding 1 Tablespoon of elderberry juice (made by boiling 1/4 cup dried elderberries in 2 cups water for 45 minutes and adding more water as needed) and 1 teaspoon of raw, organic sugar (it will ferment out) to a 32 ounce mason jar of homemade or store-bought kombucha. Cap this tightly with an airtight lid and leave at room temperature for 2-3 days until desired carbonation is reached and then put in the refrigerator until drinking. Delicious elderberry kombucha soda combines the immune boosting benefits of elderberry with the enzymes and probiotics in kombucha for a delicious and health promoting drink. 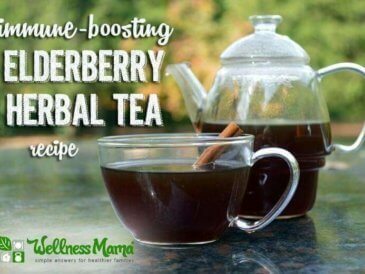 Recipe using elderberry syrup: Combine 1 Tablespoon elderberry syrup with a 32 ounce jar of kombucha. 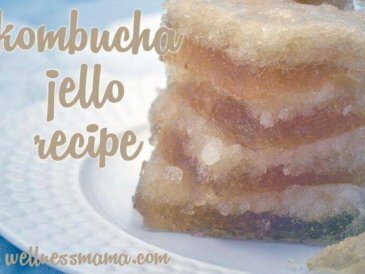 If the kombucha is already carbonated from a secondary ferment, this can be consumed immediately. If not and you want the carbonation, cap the jar tightly with an airtight lid and leave on the counter for 2-3 days before transferring to the refrigerator to store. Recipe using dried elderberries: If you don't already have elderberry syrup on hand, a simpler secondary ferment could be made by simply adding 1 Tablespoon of elderberry juice (made by boiling 1/4 cup dried elderberries in 2 cups water for 45 minutes and adding more water as needed) and 1 teaspoon of raw, organic sugar (it will ferment out) to a 32 ounce mason jar of homemade or store-bought kombucha. Cap this tightly with an airtight lid and leave at room temperature for 2-3 days until desired carbonation is reached and then put in the refrigerator until drinking. Enjoy 8 ounces per day. Ever used elderberries or tried kombucha? What did you think?